In my prior installment, I left off with us in Wadi Rum. 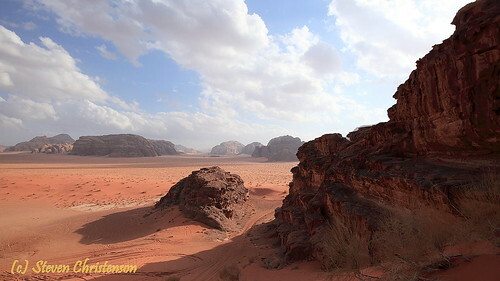 Wadi Rum is a marvelous desert with amazing color. Reminiscent of Death Valley except Wadi Rum has much more sand, and is towering on a grand scale. 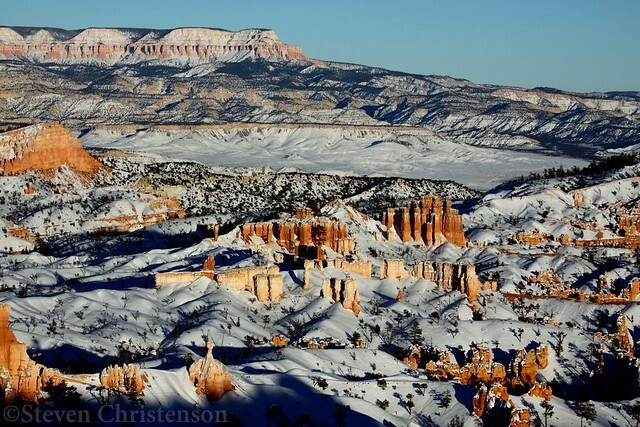 It also reminds me a bit of the Cochise Stronghold area south east of Tucson, Arizona. On our penultimate day before the official tour started, I had taken an early excursion into Petra and my travel mates picked me up. Wadi Rum is south of Ma’an and north east of Aqaba. As you drive there the desert becomes more lively. We were also blessed with blue sky and plenty of puffy white clouds. 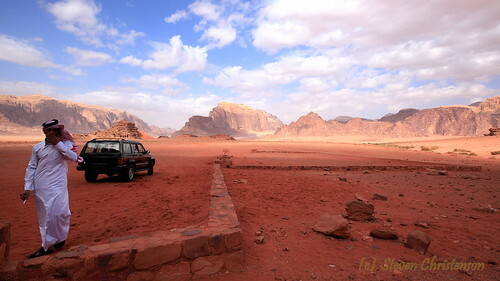 We arrived at the entrance to Wadi Rum, there is a parking area to the left. Several men dressed in typical Arab headress motioned us to park in a particular spot and asked us what our plans were. They didn’t have “park badges” or any sort of official looking uniform, so it was at first a little off-putting. 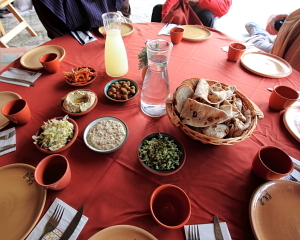 We later came to realize that the Jordanians are as a whole marvelously lovely people who are flexible, accommodating and honest. We told him that we wanted to visit Wadi Rum and he told us we’d need a 4×4 to explore in there. I knew that this was probably true. He asked us how long we wanted to stay and what we were interested in. I told him 3-4 hours and we’d like to visit at least one or two arches, and anything else that would “make a nice photo”. He quoted us a price which included the 5 Dinar per person admission charge. It seemed reasonable (about $35 per person for a 4 hour driver led jeep ride through the desert). But we needed a bio break and I wanted to check the posted prices to prevent being “taken”. In the end we took him up on the trip. Never quite got his name, but he was patient and informative, and took us to many lovely places. Here he is with our ride in the background as we park near a narrow slot canyon with a natural spring in it. An Oasis in the desert, literally. Adjacent to the slot canyon was a Beadouin tent where we were served – for free – Beadouin Whiskey – sweetened tea made over a fire. I can’t quite put my finger on why, but the hospitality and charm of the Beadouin people everywhere I met them was so comforting. The shop keeper explained that it was his special tea. At once when I tasted it I said, mmmh, I taste cardamom and sage. His face lit up, “Yes!” and he named a few other ingredients. I regret that I didn’t buy a packet to take home and savor. After returning to our ride our guide and driver asked us if we wanted to “go faster”. Our lady-folk declined. But at one point, just after visiting “Lawrence’s House” (a Nabataean ruin), he took us up a steep sandy hill and back down. FUN. 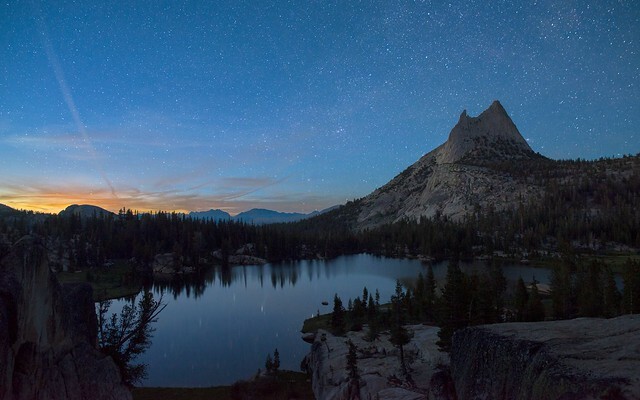 I’d relish the opportunity to spend the night under the stars there. The Beadouin’s have well furnished tents with modern conveniences. The scale of the place is huge and as photographer, a 4×4 and plenty of time there are both necessities. 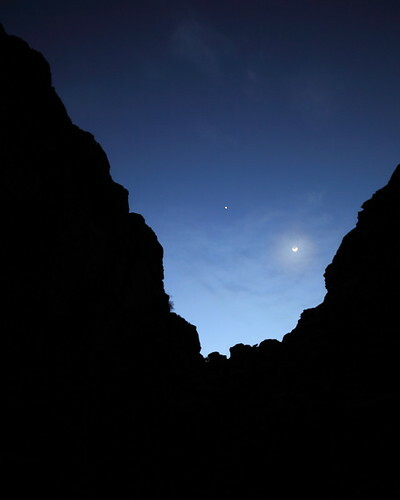 The place is so remote, I can imagine the incredible starry skies and tales of the Arabian Knights. After leaving Wadi Rum, we drove about 3 hours north to Amman, the largest city in Jordan with a population just shy of a million. It felt like a big city and at night the streets were a bit bewildering. The maps we had were not complete – showing only one out of every 5 or six streets. We definitely found some gaping potholes but it took us about an hour to find our hotel. We stopped and asked a Tourist Policeman directions. As with the other Jordanians, he was very helpful. He talked to about a half dozen people and then brought a person over who gave us accurate directions. I wonder if the police in your average big US city would have taken such time and care. We awoke early the next morning and headed north to Jerash, a Roman ruin which is largely intact and apparently the second largest ruin in the world after Ephesus in Turkey. Nothing is quite exciting as walking through 2,000 years of history and imaging the bustle and the people. After our Jerash tour we made an 8-minute stop at Ajlun Castle. Mind you it took us about an hour and a half of driving to get there and back, but we were up against a time deadline to return the rental car. Our official tour would start the following morning. The official tour guide was Ghassan (Gus). A charming man who clearly knew his land (guides are required to pass courses to get their official guide license). Guess where we were going? Petra! Early in the morning we checked out of out the hotel and boarded a bus. We traveled along the Kings’ Highway which at times overlooks the Dead Sea as at Karak Castle. We arrived later than we expected at Taybet Zaman. 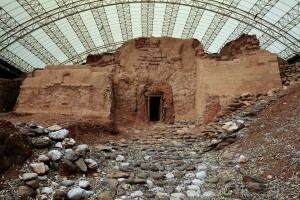 Taybet Zaman is a reconstructed town where each room was formally a house. Lots of stone and a pretty setting. Unfortunately the late arrival – and the longish ride to the Petra entrance meant we would not be able to tour Petra at night for their “Romance Night”. The next morning we checked out and headed via bus to Petra for my third visit. Gus pointed out many things along the route in that I had missed in my prior two visits, but I had already arranged with my “taxi” driver, Mansour to travel by donkey from the area near the Roman street to a place he called the “Snake Monument”. So off I went on donkey well away from the normal Petra group. It occurred to me at one point that I was going who-knows-where with a man I didn’t know all that well. He could have knocked me down, taken my backpack full of expensive camera gear and the donkeys and I’d have been hard pressed to do much. But that’s just not the way it works in Jordan. Mansour was careful to make sure I was safe as we hitched the donkeys at the end of a canyon and clambered up the slick rock for the all important photo opportunities followed by tea at an honest to-goodness they-live-in-their-tent Beadouin people. Mansour told the boy (in Arabic) that I was there to kill him. I wouldn’t have known otherwise why the boy went away crying, but I told Mansour that if he wanted to be paid he’d have to be as kind to children as I would be. Thereafter the little lad cheered up and behaved like a normal curious, well mannered little one. 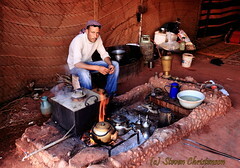 Photo 7: Beadouin Hospitality near Petra. Time was short so on the way Mansour would take me to the Beadouin village of Um Seihun where I’d catch a ride to the bus parking lot. 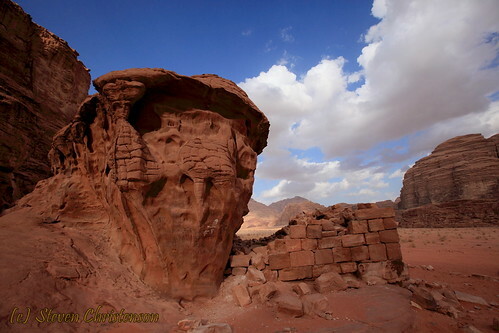 Um Seihun was built when Petra became a UNESCO World Heritage site. The government provided housing for the Beadouins who otherwise would continue to live and graze in the Petra site. In turn the Beadouin still take their flocks down into the area and sell trinkets, donkey, horse and camel rides to the tourists. If you’re willing to bargain just a little, the prices are more than reasonable. Few of the locals are getting rich from this trade. Beware, though: the Beadouin children are very charming. “One Dinar, lady, One Dinar” a six year old repeated to my wife. I bought a twelve pack of postcards from him. $1.60? That’s cheap. When we reached the spot where I was to catch a ride I paid Mansour and he then started a long negotiation with the man with the car. Apparently it was not “all arranged”. In the end, I think 8 Dinar of my donkey fee went to the driver who made the comment that “Mansour was a good negotiator – normally he charged 10 Dinar” ($15) for the 15 minute drive. I arrived back to the bus in plenty of time. I do miss Petra though – so much yet to see and photograph there. The bus drove north, stopping a time or two enroute back to Amman where we’d spend one more night in the same so-so hotel before heading to Bethany Beyond Jordan (historical site where John the Baptist baptized Jesus Christ), Madaba (where amazing stone tile work has been found), Mount Nebo, Mount Carmel and then across the Allenby Bridge into Israel for lunch at Genesis Land. Photo 8: Genesis Land.. before the yummy date-honey chicken arrived. Genesis Land was kitchy. Eleazar, Abraham’s servant greets you and takes you (after you don your period cloak) to a Beadouin tent where Abraham insures that you are well fed. The date-honey glazed chicken was, mmmmmh good, as were many of the other traditional period authentic dishes. The next 7 days of the journey we ran ’round like, well, tourists. Our guide in Israel, David Jacobs is a walking encyclopedia of history, culture, and a bit of traveling wit. I can’t even remember a fifth of the places we visited. Many frankly were remarkable for their history rather than their current state of being. Of our time in Israel, my favorite places were Masada, Caesarea, Jerusalem, Tell Dan, and the Sea of Galilee. 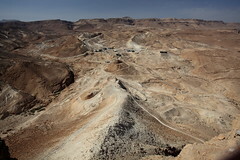 Photo 9: Masada and the Roman Ramp built to beseige it. 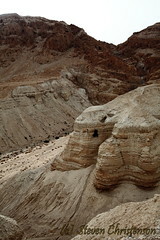 The high fortress of Masada overlooks the Dead Sea. The Jews living there managed to thumb their noses at Romans and their mighty army for three years. The Romans camped around Masada and built walls so that the Masadan’s could not leave, but the Romans were unsuccessful besieging the city until they built a huge ramp. The Israeli military are frequent visitors to Masada where the rich, tenacious history of their forebears inspires them to keep up the good fight and remember the sometimes high cost of freedom. The entire Dead Sea area was an interesting contrast of barren desert and occasional oases. In a comedy of errors I left my bathing suit in the bus and didn’t partake of the Dead Sea floating experience. I don’t think I missed all that much, frankly. 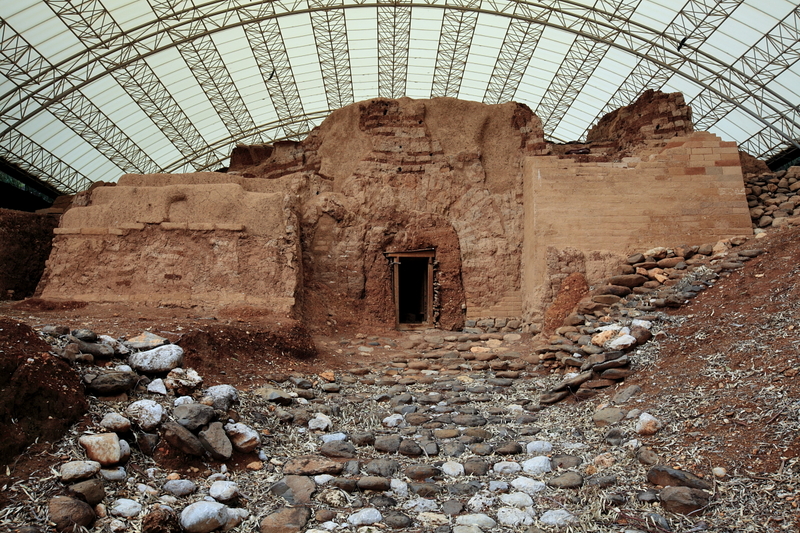 The exhibits and terrain at Qumran where the Dead Sea scrolls were found were fascinating. Imagining living in such an arid place where the summer temperatures get very hot is, well, it’s making me sweat just contemplating it. Ritual mikveh’s (baths for purification) were everywhere about. Caesarea along the Mediterranean Coast found us walking through another well preserved Roman ruin and included a large aqueduct built by the crazy Herod the “Great”. Photo 12: The oldest gates from the ancient city of Dan. Note that they are made of Adobe brick. 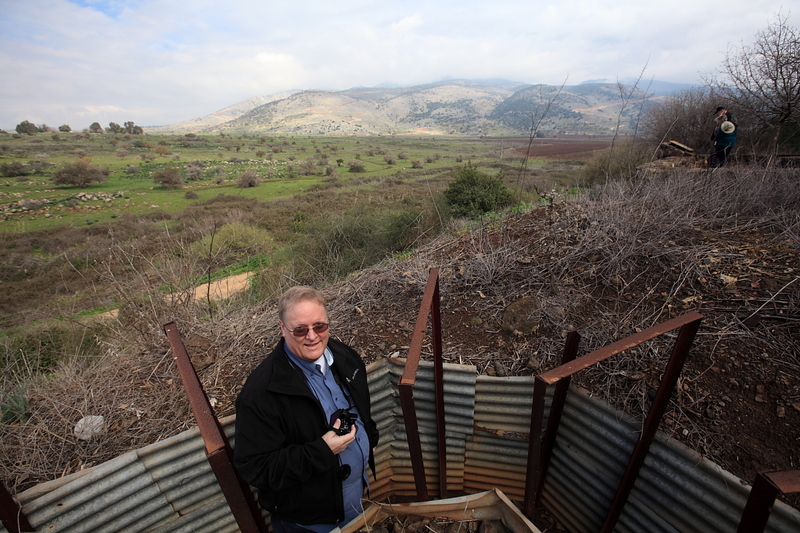 In the north eastern part of Israel near the Golan Heights, Tell Dan was such an amazing contrast. The place is lush by comparison to the desert like areas elsewhere. Our hike to the ancient ruins of Dan found us enjoying rushing creeks, heavy woods, cooler weather and fantastic views – including a view from the bunkers overlooking the Israel – Syria border. We waved at the military outpost high up on the heights. 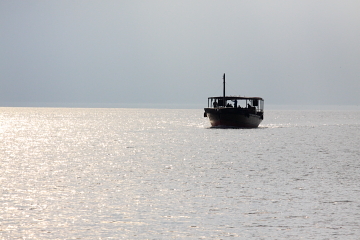 We spent several nights using Nof Ginosar along the Sea of Galilee as our base of operations. It was good to stay in one place (if you could call it that!) and the large food buffet was generous and varied. Fresh squeezed orange juice, and a variety that boggled the mind. The most surreal, and in a way disheartening experience was our trip into Bethlehem to visit the birthplace of Jesus Christ. 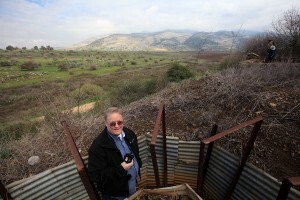 Bethlehem is a Palestinian controlled area perhaps 8 miles from Jerusalem. Entering Bethlehem means passing through a security checkpoint and exchanging a Jewish guide for a Palestinian guide. The signage that previously was always in Hebrew, Arabic and English now was only in Arabic and English. Our Palestinian guide, like the others was a good ambassador. He almost seemed to be pleading with tourists to come. We spent several hours touring the area, visiting a cave that may have been the birthplace of Christ, or at least a stable where the animals may have been kept as well as an elaborate confined area deep in the bottom of a series of churches. It’s hard to imagine these places as they may have been when ornate (and to my eye tacky) buildings cover them over. But on the other hand, had the various churches not preserved them two thousand years of various occupiers would certainly not have thought twice about using these “holy” locations for whatever purpose seemed best at the time – and many were. As evening fell we passed the “Stars and Bucks” coffee shop as the bus took us back to our hotel in Jerusalem – a very nice hotel I might add with excellent food and comfortable accommodations. The wait to cross out of Bethlehem was quite long… perhaps 45 minutes. Later in the trip I saw with my eyes something that literally made me weep. Walls. I felt as if I had just been transported back to Berlin and the east and west had been carved up to separate brothers and cousins. I remember visiting the Mauer Museum (Wall Museum in Berlin) and realizing how naive I am as an American about what happened in Berlin. The walls in Israel are fairly recent and were meant to slow the violence and the attacks on motorists passing between the mostly Jewish sections of Jerusalem and the mostly Jewish sections of western Israel. Apparently the walls are working, but they don’t just protect the freeways as the sound barrier walls do in California – they encircle whole towns. 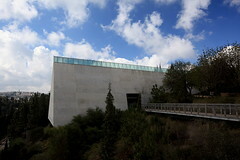 Photo 15: Yad Vashem Holocause Memorial, Jerusalem. I did weep at Yad Vashem. 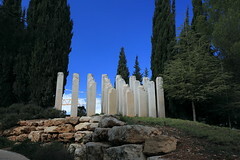 The Holocaust memorial high on the hills overlooking Jerusalem – especially at the “Children’s Holocaust” memorial where simple sculptures and a moving “million candles” exhibit wrench the heart. I’ve been teaching a first grade Sunday School for nearly twenty years and hearing the names, ages and nationalities of the children killed during the Holocaust sent me in search of a tissue. I imagined the names of the children I have known being read only here it takes 22 months to cycle through the million and a half names each one a young soul. For the final installment of my Middle East Excursion, please see Part 3. This entry was posted in Ravings, Travel and tagged Amman, Getting lost, Israel, Jordan, Mediterranean, Petra, Sea of Galilee, touring, travel, Wadi Rum on February 21, 2011 by Steven Christenson. I had big dreams. 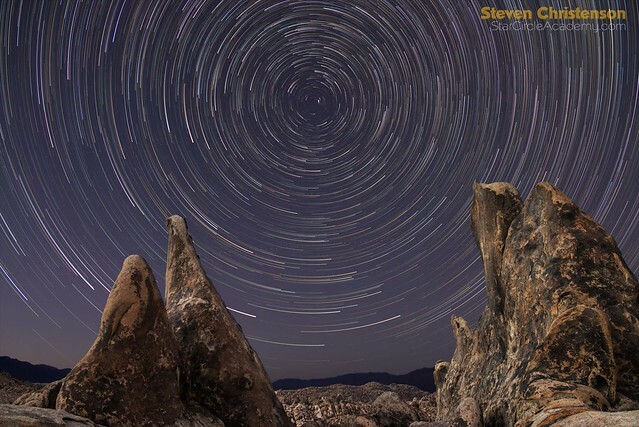 Starry skies over places like the Great Pyramid in Giza, incredible formations in Petra, and so on. But what happened was quite a bit different. 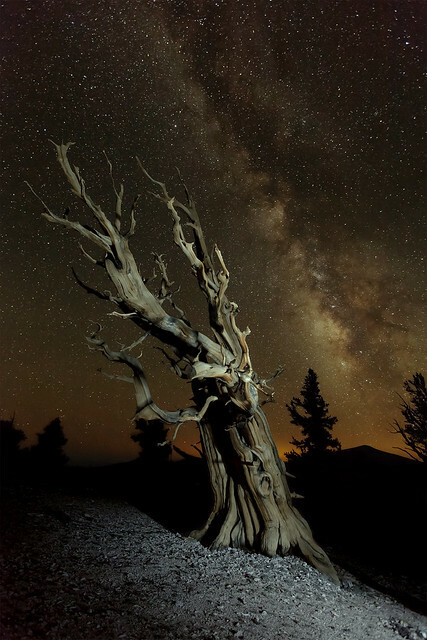 Photos of landscapes (and a few night shots) from the middle east. Instead of starting our journey with a few days in Cairo, the Egyptians decided to overthrow Mubarak rendering travel there impossible. How selfish and inconvenient of them, eh? The good news about the uprising is that it meant that the first 3 days of my scheduled tour were negated. 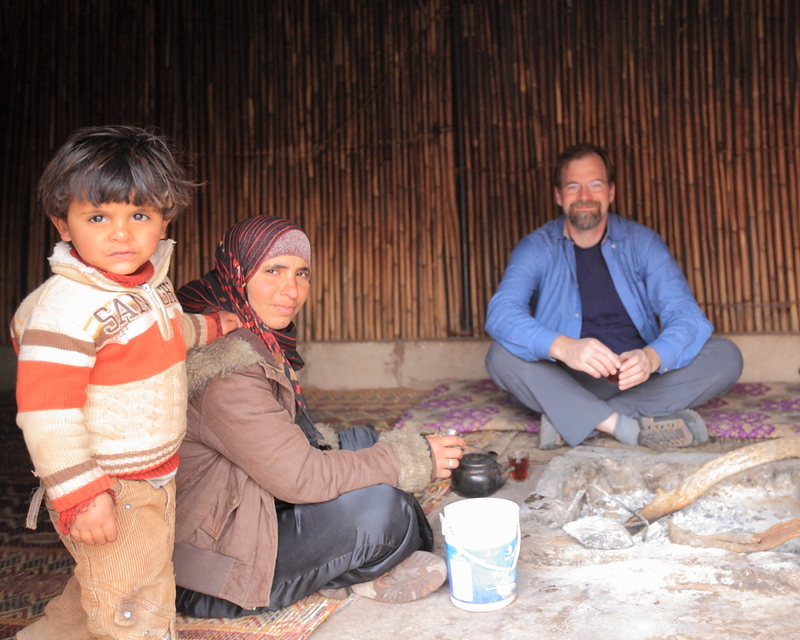 Rather than dropping days out of the tour, my wife, myself and another couple (Bert and Dale) traveled on our own to Jordan. This was fortuitous in that we were able to go more places than the tour would have taken us including the most photographically interesting locations: Petra and Wadi Rum. It was also rather necessary since we had already planned to travel to London to visit the exhibit at the Royal Observatory before the tour was scheduled to start. 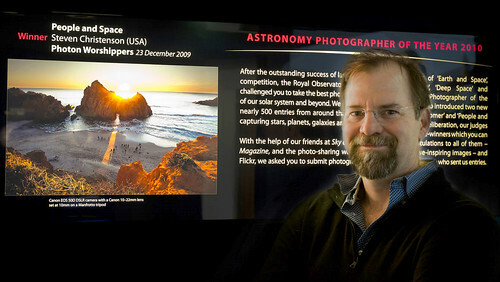 It was fun being recognized at the Royal Observatory. And it’s probably the first time in my life anyone (about a half a dozen people, actually) asked for my autograph (on postcards and notecards featuring my image, no less). Getting back to the travel… Many people recommended Wadi Rum – and I knew I’d want to spend more time in Petra than the 2/3 of a day that the tour provided for. 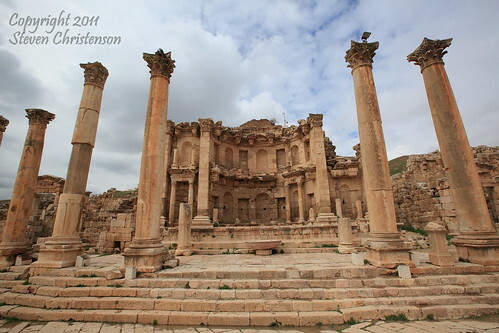 So we made a whirlwind trip to the Royal Observatory and left the next day for Amman, Jordan where we arrived at nearly midnight and then drove almost 4 hours to Petra. The desert road through Jordan was in good shape. Finding a gas station in the night was a bit of an adventure. Filling the tank cost about $80. We Americans are spoiled by cheap gas. Yes, cheap. Jordan has no oil resources and like most of Europe the cost is as much as 1.076 Jordanian Dinar ($1.69 USD) per litre. That’s $6.43 USD per gallon. In a relatively poor country like Jordan, that is an enormous burden compared to the cheaper energy costs here in the US. One big gotcha on Jordanian roadways: speed bumps. Usually well marked, but sometimes the stealth ones will send you flying into the ceiling of the car. Just ask my wife. Near the very end of our travel to Petra – at about 3:20 in the AM, we encountered thick, San Francisco-esq fog in the higher altitudes before descending into Wadi Musa and Petra. 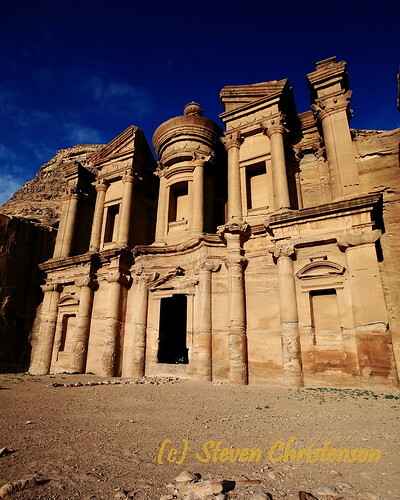 Petra by-the-way refers to both the name of the modern town AND the ancient Nabataean ruins. The tourism bureau in Jordan has poured a LOT of money into the area around modern Petra. Swanky hotels are everywhere. But the route there is rather depressing for the poverty and severely austere environment. The fog didn’t descend into the inhabited areas of modern Petra. 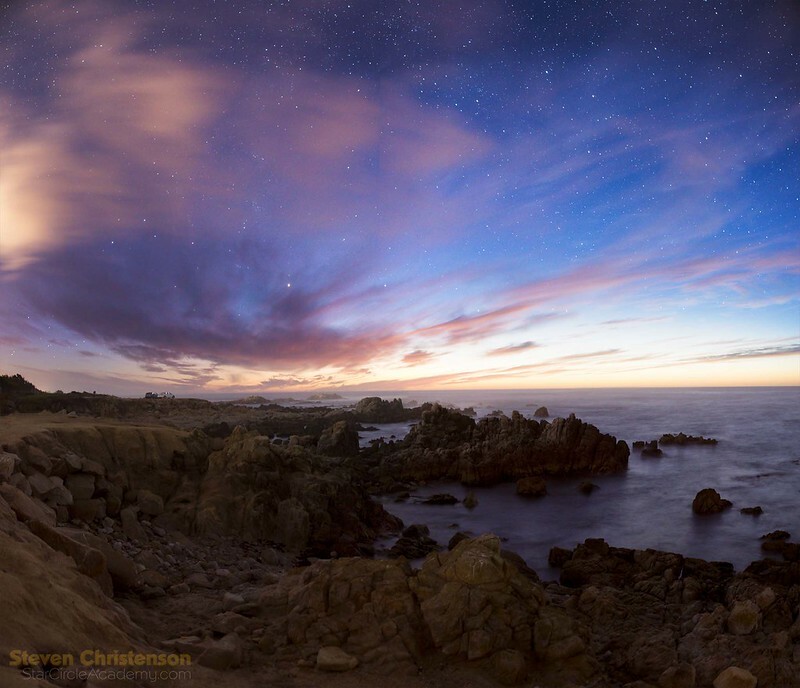 But as you can guess a 4:00 am arrival and thick cloud layer above made night photography impractical. Unfortunately heavy cloud cover occurred nearly every night during the trip. My three clear night scenarios coincided with either exhaustion or night time arrival an an urban environment where I was too timid (and tired) to seek out some interesting foreground. Still groggy from travel, we didn’t even make it out of doors of the Petra Marriott until about 11 am and spent from about 12:45 pm until 6 pm in Petra. One of the nasty little surprises we encountered was that the “about 10 dinars” Petra entry fee quoted by the hotel clerk turned out to be 50 dinar – $75 USD per person. And the Petra admission tickets could only be paid in Jordanian dinar – no credit cards. Not willing to trust the exchange service adjacent to the payment site, and having too little dinar (and too few USD to exchange), I set off for the nearest ATM machine. I was told it was located in the Movenpick Hotel. Finding the entrance proved challenging. Heavy security is everywhere. In Jordan, every major hotel has baggage screeners and metal detectors. I put my photo backpack through the screener and then asked at the concierge desk where to find the ATM machine. I was then told that it was broken but that I could exchange money at the desk. The exchange rate quoted was decent EXCEPT that they also charged a 5 dinar fee for any transaction… and remember I didn’t have enough USD on me anyway. Sigh. After returning to the Petra entry area, I discovered my wife had enough USD left for me to exchange to gain us entry. Bert and Dale and my wife all got one day 50 dinar tickets. I bought a 2 day ticket for an additional 5 dinar because I intended to return the next morning as early as I could. It was a wise investment. During our trip that day we dallied, a lot. I ran partway up the trail to Ad Deir (aka the Monastery) intending to turn around at 4:30 PM. Halfway up I elected to go with a donkey for 15 dinar to cut the time (and the sweat). I got to Ad Deir at a great time as the setting sun broke through some haze and clearing clouds and cast sweet low angle light on the impressive building carved out of stone. To get a sense of scale, those are two people seated in the doorway. My first opportunity for night shooting occurred at the end of the first full day in Petra, Jordan – in ancient Petra itself (Photo 3). We exited well after sunset and though the skies were getting hazy, I imagined myself staying in Petra for night photography – except that I hadn’t brought by tripod with me! I improvised with a carefully propped up camera at high ISO. With a tripod I could have exposed for the foreground and you’d have seen an impressive natural canyon called a “siq” (Photo 4). The next morning I booked a “local taxi (a donkey) for a trek up to the “High Place of Sacrifice”. My guide was a Bedouin named Mansour. For fun I shot a video from my saddle on the donkey. It is a bit bumpy, of course, but gives you an idea what the trip (and a donkey ride are like). See the Petra Donkey Cam! During the night prior to my second Petra foray I got a few shots, but the moving cloud cover dissuaded me from making a star trail (Photo 5). 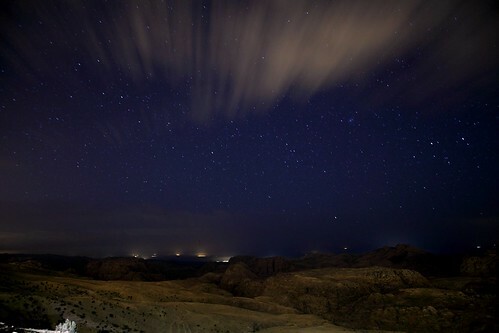 Photo 5: Petra Night Sky - with clouds. Tours are an informative way to learn the lay of the land and the history… but as I suspected not well suited to photography. Generally we arrived at interesting locations well after sunrise and left well before sunset. And since we were almost never in the same place twice, scouting for sunrise, sunset, or night locations was mostly futile. Remaining in one spot for more than 15 minutes also seldom happens. Indeed the last night of the tour I got lost as the group went ahead in the dark… more on that in the next installment. After Petra we “self tourers” visited Wadi Rum. Wow. It was a gorgeous and immense place. 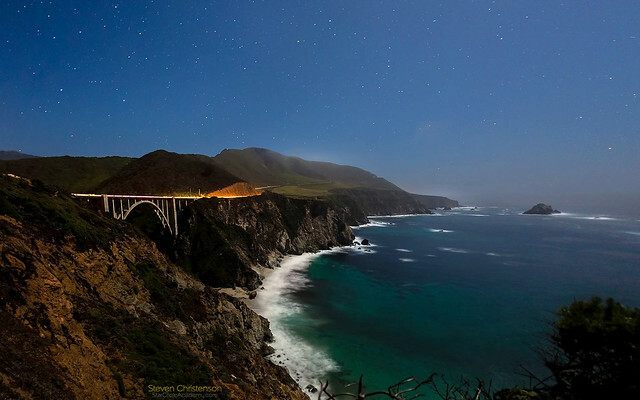 I would have loved to spend a night there. I imagine it would have been extremely dark with incredible stars. It was, however, mostly cloudy and somewhat hazy. More on my adventures in the next column. Oh, by the way the Almost Nothing title is relative to my photography aspirations, not the trip itself! 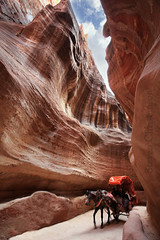 This entry was posted in Ravings, Travel and tagged Astronomy Photographer of the Year, Exhibit, Greenwich, Jordan, Night Skies, Petra, Royal Observatory, Siq, Slot Canyon, Wadi Musa, Wadi Rum on February 20, 2011 by Steven Christenson.